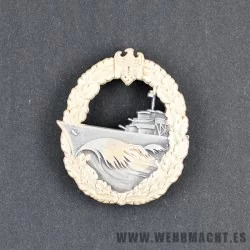 Replica of the Kriegsmarine Auxiliary Cruiser badge (German: Blockadebrecher). Was instituted on April 1st 1941 for award for service on warships or merchant vessels that attempted to break through the British sea blockade of Germany. Mid to late war type in zinc. Gilt wreath with blackened gunmetal centre. Complete with makers name on reverse and correct style needle pin.